A highly successful internship program run by the Akamai Workforce Initiative (AWI) is starting another summer session this week, thanks in part to funding from the Thirty Meter Telescope (TMT) Project. In Hawaiian, akamai means "smart, clever or expert," and those words certainly characterize the college students who take part in the eight-week program. Since 2003, AWI has helped advance local Hawaiians into careers in science, technology, engineering and mathematics (STEM). Some of the very jobs that will be created by the TMT project in the years ahead will likely be filled by AWI alumni. 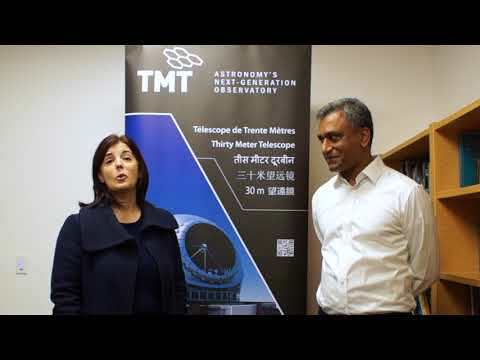 "A lot of Hawaiian students who didn't know about TMT learn about the project through its sponsorship of Akamai, and a lot of those kids have then said 'This is what I want to do – I want to work for TMT'," says Lisa Hunter, director of AWI at the University of Hawaii Institute for Astronomy. "The students are excited about the possibility of having an intellectually rewarding, well-paying technical job at home." TMT has supported AWI for three summers now. Historically, AWI has enrolled an average of 15 students each year at each of two sites, one on Maui and the other since 2005 in Hilo on the Big Island. Overall funding has been a bit tighter in recent years, however. Were it not for TMT's help, the Big Island program, which will host six students, would not exist this summer. Those six students are, in alphabetical order: Devin Chu, Amber Fulkerson, Keone Hiraide, Sean Jones, Anthony Sylvester and Elizabeth Claire Vanaman. The AWI summer program begins with a "short course" lasting five days, held at University of Hawaii Maui College, one of the main partners in AWI. This intensive preparation for the upcoming internship and beyond helps bridge the gap between follow-the-instructions setting of a classroom laboratory and fully independent research projects. Key to this transition is learning communication skills in professional settings, such as conferring with mentors and presenting projects at meetings. "We are getting students used to talking about science and technology," says Hunter. "We give them practice and guidance in explaining their ideas, their approach to solving a problem, and supporting their solution." Another important aspect of the short course is instilling an appreciation of Hawaiian culture related to telescope projects. Speakers, for example, are brought in to talk about the economics of observatories as well as the cultural significance of the mountain on which they stand. "We want the students to appreciate and respect different perspectives related to telescopes in Hawaii," says Hunter. After the short course, students then enter the immersive seven-week portion of the AWI, working under mentors on full-fledged research projects. On the Big Island, students work at the astronomical observatories atop Mauna Kea, while in Maui the students are placed within high-tech companies and at the Maui Institute for Astronomy (AWI headquarters). Students intern full-time, and in addition to their workplace duties, they have assignments for an ongoing, integrated communications course, including meetings with an instructor a couple hours per week. At the conclusion of the AWI internship, students give a 10-minute presentation at a capstone event, which this year falls on August 9. AWI staff closely coach the students, building up their confidence and skills. "We set a very high bar and we've become known for the high-quality of these presentations," says Hunter. "We invite the whole community, including mentors and staff, to the presentations, and every year it is a proud moment for everybody involved. Students have even been offered jobs after the event." Support from TMT is also enabling a new AWI workshop in Hilo this August. The workshop will focus on how to plan and outline a technical project, critical skills both at astronomical observatories and in the STEM industry as a whole, according to a workforce survey AWI conducted in designing the workshop. Participants will learn how to outline and propose a solution to a real-life problem: the failure of a back-up electrical generator at an observatory. "Employers told us that problem-solving, project management, teamwork, and communication are the kinds of skills that make their personnel valuable. This workshop is aimed at developing just those kinds of skills," says Hunter. AWI contacts all alumni of the program every year to gauge how effective the program is at keeping students on track for a STEM career. Out of the 95 percent of alumni who responded, 87 percent reported that they were on the pathway to a STEM career. A third had already entered the STEM workforce, and more than 50 percent were enrolled in undergraduate or graduate STEM courses. Companies where AWI interns have been placed include Akimeka, Oceanit, Hnu Photonics, the Institute for Astronomy, MHPCC, Pacific Defense Solutions, Pacific Disaster Center, Textron Systems, Trex; observatories include the Canada France Hawaii Telescope, Gemini Observatory, Smithsonian Submillimeter Array, Subaru Telescope, and W.M. Keck Observatory. Along with TMT funding, AWI is supported by a National Science Foundation grant, the University of Hawaii, the Air Force Office of Scientific Research and the National Solar Observatory.